Fashion magazines are rarely what you might call user-friendly. But if you're plus size? Forget it. You get one or two pages, tops. Hence women like Chastity Garner Valentine play an important role for shoppers size 14 and up. As proprietor of the blog Garner Style, she models outfits, dispenses advice and highlights promising new collections—filling the role Elle or Lucky might for somebody smaller. Sometimes, though, she plays a rowdier role. 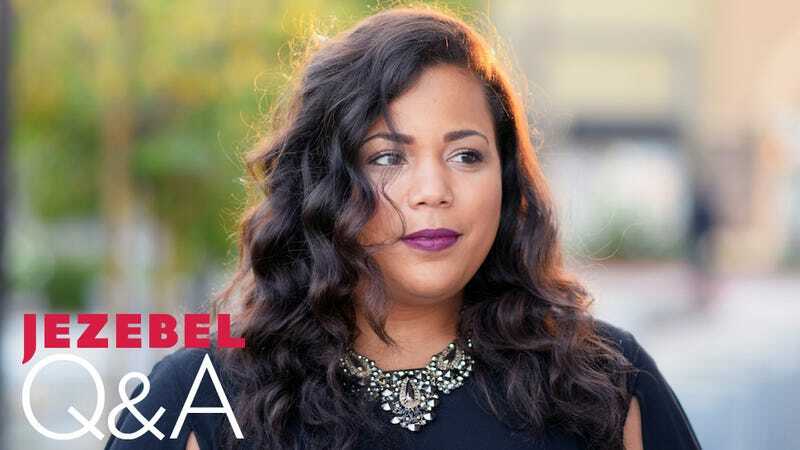 You might remember her as the blogger who kicked up a fuss when she proposed a boycott of Target over their lack of plus-size options as part of the Altuzarra for Target collection. You might also recognize her as one of the faces of Target's just-debuted plus-size line, Ava & Viv. It's a vivid illustration of the clout wielded by a blogger like Garner Valentine, who boasts 329,000 Facebook fans, 13,000 Twitter followers and 73,000 Instagram fans. And she was kind enough to hop on the phone for a chat about the changing plus size fashion business, how it differs from the straight size business and her own personal style, as well. Tell me a little bit about how you got started blogging. So I was in graduate school in '05, and I had a boyfriend that was like, "Oh, you should try plus-size modeling," and said it enough times to where I went and tried it. I met up with a designer there and for a couple of years I was doing some local plus-size modeling in Atlanta. Then I fell out of a tree and tore my ACL. (Don't ask me why.) And I'm on the couch being like, I really love fashion, I still want to be in fashion. Modeling was definitely not my passion but, in all realness, I was too big to be a model. Most of the models were like 14s, 16s, and I'm more than that. So I started a style business, and the blog was supposed to be in support in the style business, and the blog kinda turned into this whole other thing, and I don't really style anymore. It's primarily the blog, but I will take a style client—I might take one or two a year. Styling is very involved, with all the demands of the blog. What's involved in the blogging gig? What's your day-to-day like? For me, my personal formula is, one, I'm on top of my email. I'm basically on my computer all day. I'm on top of my social media. I'm very responsive. My Facebook page, I just hit like 325,000 [followers], but I read about 95 percent of those comments and I comment back at people. Social media is just a job in itself. And you don't necessarily get the reward back immediately, but it's definitely there and it's definitely valuable to interact with people who read your blog and people who support your blog and support them back, answering questions and whatnot. I write for my blog, but I'm also writing for About.com and I try to get that in there a few days a week. I actually just got an intern to help me with managing some of the smaller tasks that I have, because it had definitely gotten to the point where I was like, I don't know how much of this I can do by myself anymore. I am my own manager. I don't hire a manager. So when deals come to my plate, I negotiate these deals, and that's a lot of back and forth. It could take two or three weeks, it could take a month, it could take two months. So it's every day, being on top of contracts, back and forth with your lawyers. It's an all-day process that comes from a lot of small things but turns into twelve hours a day. You started back in 2008, so you've been doing this for a while. How long did it take for it to take off? Were there things that bumped you up to the next level? It was kind of like a slow and steady thing. I can tell you some of the things that bumped me over into full-time status. It was being featured in the New York Times in, like, late 2012, and being featured as a plus-size blogger on IFB. Those two things bumped me over, because it pushed my traffic and it pushed my readership over a certain level that allowed me to turn an amount that would be sustainable for living. Then it was moving along, and it got real when I went viral with the boycott of Target. That took it to another level, not only being able to support myself but to do well and be a little bit more comfortable. Was that just a question of traffic, or were you seeing more opportunities available? What sorts of opportunities unlock as you have a higher profile? For me, brand ambassadorship. I'm currently a style ambassador for both Target and Torrid. And then, a lot of what I'm dealing with is sponsored opportunities, sponsored posts and working with different brands. And I would also say just on a level of affiliate sales—I definitely would never want my blog to be solely dependent on another company. So it's kind of like my own social media allows me to have a bit of autonomy, just by affiliate marketing, having the outfit posts, picking out some really cute pieces from what's available in plus-size and posting them on my social media. It's definitely like the blog is able to even sustain itself just on the affiliate marketing. How would you describe your personal style? There are so many people out there who want to be style bloggers. What helps you stand out? Classic with a twist, definitely polished. I think the thing that allows me to stand apart is that I am not a smaller blogger. I am not on the small side of plus. My hips are a solid size 26, I'm a 16/18 on top. To see somebody of my size dress well I think was a huge factor in people being drawn to me because a lot of the plus-size bloggers, not taking away from anything they do, but they're a 16, 18, smaller even, closer to the size of the models that they use as plus-size models. And I'm just really big. To see somebody dress well at that size, it lets people know it's really possible. If you put work towards it, it's possible. You've been doing this for the length of what I consider the plus-size boom. What are some of the changes you've seen in the industry as you've been blogging? Personally, I think it's been crazy. Just monumental changes. When I started, even when I was doing modeling, I would say there were maybe five or six plus-size brands. You had your Lane Bryant, but then you had brands like Igigi, Monif C. So really even the work, if you were associated with the plus-size industry, wasn't even there, because there wasn't a lot of stuff out there. Between the models, the independent designers and people like Plus Model Magazine, it's kinda like they helped create the industry. They helped create the demand. It's definitely been a grassroots effort. And I know some people will argue it's so slow, but to me, when you think about it, in the last two years, plus size clothing has boomed. Every year you hear a new person saying, "Oh, we're gonna do plus sizes." Or there's a new plus size line coming out. I remember being in high school and I would wear boys' clothes, because the options for plus size were so bad that I would rather wear designer Polo boys' clothes than to wear what was being offered. And now there's so much. I guess we don't think that we've reached the pinnacle, we're not there yet, there's still so much work to be done. But there's been a lot of growth in a small amount of time. It's interesting because it's like every time we get one frustration dealt with there's more, so it's easy to forget how bad it was ten years ago, when it was like, "Awesome, another asymmetrical black polyester dress. I've already got five of these." But at one time, that wasn't even possible. I remember being in high school and Lane Bryant being a brand that was for older women and just thinking, I can't shop here. I cannot shop here! But even going into Lane Bryant now, so much has changed there. I'm in awe, I really am. And even like, how different it is from the mainstream fashion industry. You see women of color doing really well, heading up major blogs and magazines and that sort of thing and actually pushing the industry forward, as opposed to when you go to mainstream fashion week, you barely see a black model on the runway. So I definitely love that side of it. Because if I was in regular fashion, I don't know if I could ever even walk into a magazine today as a person that has accomplished all these things and still get a job in mainstream fashion. So, for me, I think yes the industry does have a lot of flaws but it also has a lot of good things about it. I feel like the plus size business is amazingly driven by customers, as opposed to top-down dictates from Anna Wintour or whatever. I mean, I have actually seen—and I will not name names—but I have seen outfits that I have done show up on websites. Like my outfit, or a picture of the outfit, in something that everybody wanted but it was out of stock by the time I wore it. And I've seen it show up on plus-size websites. I don't think that's by coincidence. I've seen companies saying "We're always looking at the bloggers, we're always looking at what they're doing." And we're very grassroots, we're just living our lives and we're living our lives in these photos, and they're paying attention. They go to our pages, they read what our commenters are saying and it makes sense—this blogger wore this, it's not available, why don't we make it? I've seen it happen more than one time. Yeah, now that I think about it, once upon a time Gabi Gregg for instance would wear something cool that was no longer available and you'd know you were out of luck. But now it just… pops up. I'm like, wait a minute, that was my outfit. I definitely think the companies are on our pages, on our social media, they're reading what people are saying. I'll ask my readers questions all the time. I'll ask a question like, "What would you like to see in plus size?" And I'm telling you, no less than 800 or 900 comments. You'd be crazy not to go and look and see what people are saying because it's market research but it's free market research. I was actually wondering — do you deal with a lot of trolls? How do you deal with them? If I'm featured on a mainstream site like Yahoo, I'm not going to read the comments. I'm just not. On my personal pages, for the most part, I will say that 95 percent of the comments are positive or constructive. Now, about five percent are either body shaming comments or snarky or just plain rude. Personally, how I deal with that is, there are places on the Internet where you can go and you can rip people down. But my places on the Internet won't be like that. So I'm definitely very active on making sure that my page is a positive pace. I've seen plus size sites, plus size affiliated sites, where people are literally sitting there tearing each other down, and there's too many places on the Internet like that. I want my place to be sort of a sanctuary where you can go and feel inspired and be positive and not leave the page going, "Well I can't wear that because they just ripped her apart." Again, I invite constructive criticism. saying "I don't like that" is fine with me. But saying, "Your knees look fat, you need to cover those up," that's a different thing. Don't body police me, but if you don't like it, say you don't like it and move on. I also know that teenagers read my pages. I get letters from teenagers all the time that are struggling with their own body image and being accepted at school and that sort of thing. I don't want them to come on there and see somebody doing body snark towards me and then be like, "Well, maybe I shouldn't wear this or maybe I shouldn't do this or maybe I shouldn't be comfortable with myself because if this person I somewhat admire is being ripped apart, then they're definitely going to rip me apart." So you keep your finger on the delete button? Mmm, no—I do ban people from time to time. I mean, to be honest with you, on my Facebook page I've got like 325,000. I have maybe banned three or four hundred people. So definitely not a lot. But I just know if you're coming over here talking about obesity and health and you're gonna die, nah, you're not going to be free to comment on my page, and that's just straight up. You can go to the Huffington Post and do that. They love that conversation over there, so you can go over there and do it. When you're putting together an outfit, where do you go? Where do you shop? How do you go about styling yourself? I definitely pull from everywhere. I did a post where I did some resale shopping from a person I know in Dallas who has a resale shop. She has vintage and stuff like that. I shop a lot at Asos. It's really bad—I shop more there than I would like to, because I don't really like to shop in one place a lot. But it's so easy. They have the Amazon kind of shipping and the next thing I know every day there's an Asos package coming to my house. I shop indie designers, definitely, because I want to keep my look original to me. There are certain indie designers I will shop from—Demestiks and Jibri. Demestiks, Beyonce wore one of his shirts one time, but he does, like, African print. So it's kind of like a world print but in nicely tailored clothing. He actually starts with a 0 and he'll go up to a 3X or a 4X, and he'll do custom pieces for you. Then Jibri is a contemporary indie designer, classic pieces, great fit. I definitely am a high/low shopper. I like to create a look that looks expensive but then I'll use one expensive piece and incorporate low-end pieces. People are like, "But you don't really shop at Target." Yes I do. I go to the section and I want to buy tees, I want to buy some of those basic pieces, or even like casual pieces to integrate with my more expensive pieces because I want to have an overall expensive look but I don't want to pay an overall expensive price. There's a lot of indie designers out there doing great work. I feel like a lot of the plus size industry has been built on indie designers, people who said, "I'm gonna make plus size clothes." And before any of the large brands were doing it, a lot of independents were doing it. That's where we were buying our clothes originally. And they were doing it well. Photo courtesy Chastity Garner Valentine.